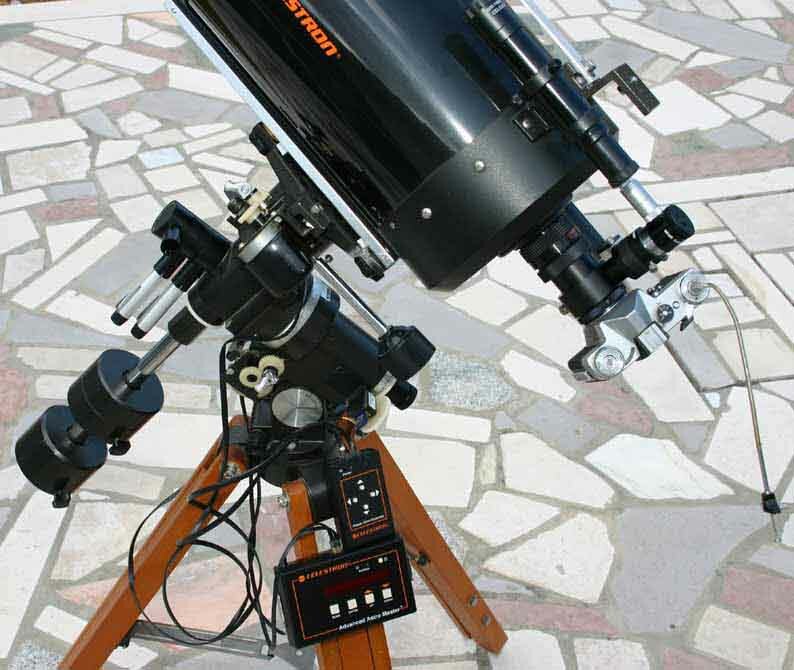 Telescope Celestron 11 with equatorial mount and sideral drive. The Horesehead Nebula region in Orion.The Horsehead Nebula (Barnard 33) is obscuring the modestly bright, extended nebula IC 434, which extends south of the bright star Zeta Orionis. 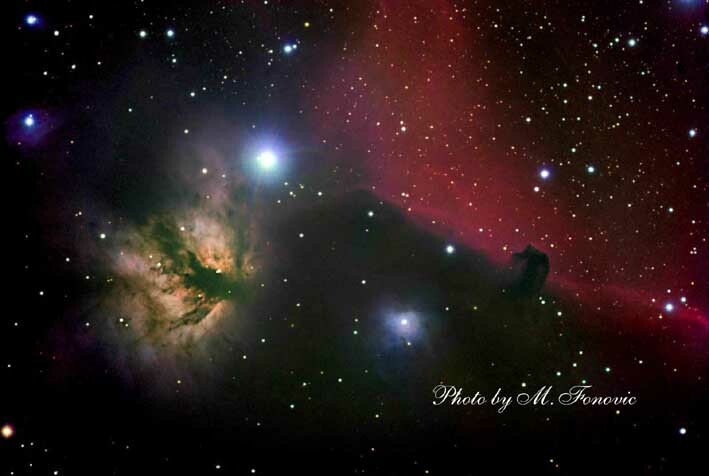 The bright small nebula close and left of the Horsehead in our image is the reflection nebula NGC 2023. Left of the bright star Zeta Orionis is the bright and conspicuous emission nebula NGC 2024. Refractor 105mm at f/5, stacked two 40-minute exposures on Kodak PPF 400. 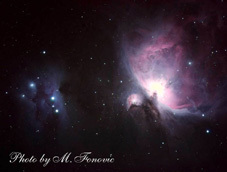 The Orion Nebula M42 is the brightest diffuse nebula in the sky, and one of the brightest deepsky objects at all. 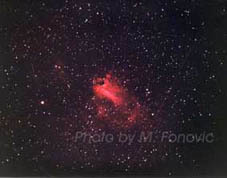 Shining with the brightness of a star of 4th magnitude.The nebula is located at a distance of about 1,600 light-years. At this distance, its angular diameter of 66x60 arc minutes corresponds to a linear diameter of about 30 light-years. M42 itself is apparently a very turbulent cloud of gas and dust, full of interesting details. Celestron 8 with focal reducer f/6.3. 45-min exposure on Fujicolor Superia 400. 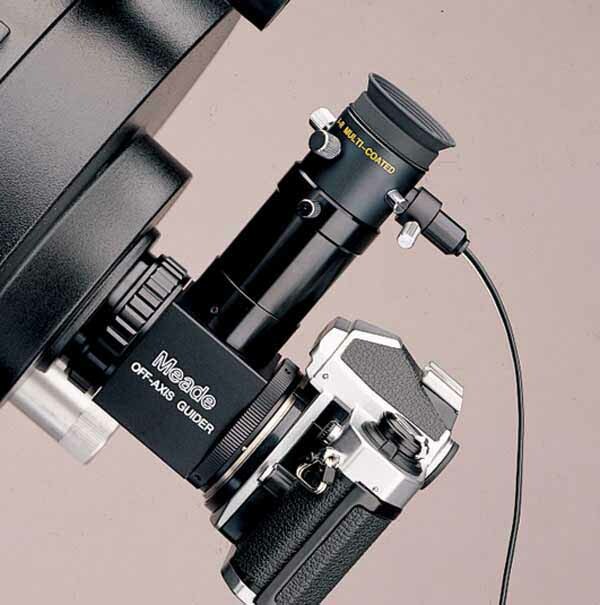 You attach a small device called an off-axis guider between your camera and your scope. 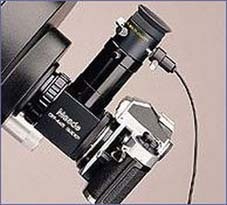 It has a tiny prism to grab a small piece of light that would never reach your camera anyway. 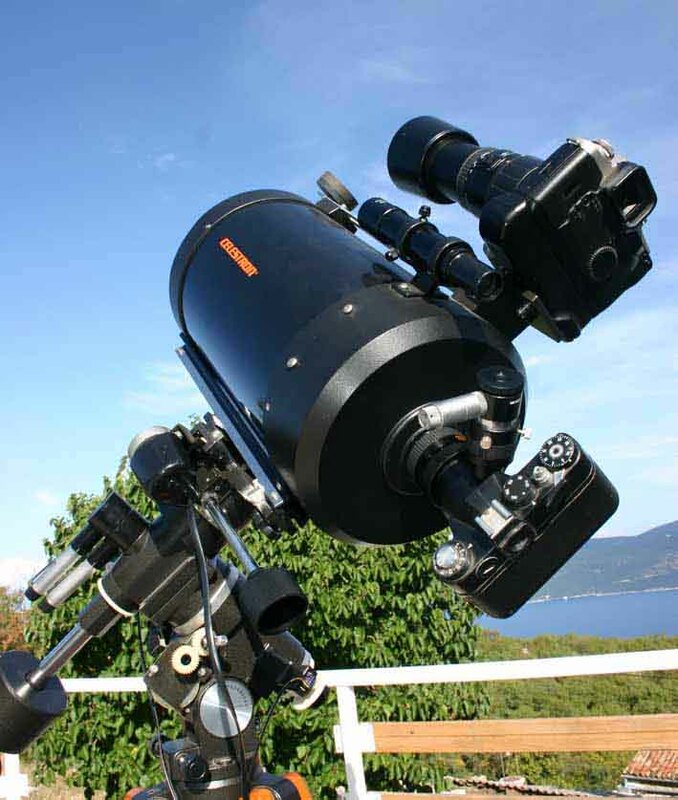 You look through it with an eyepiece and focus on a star NEAR the object you are photographing. This way you can watch that star and detect any error in time. 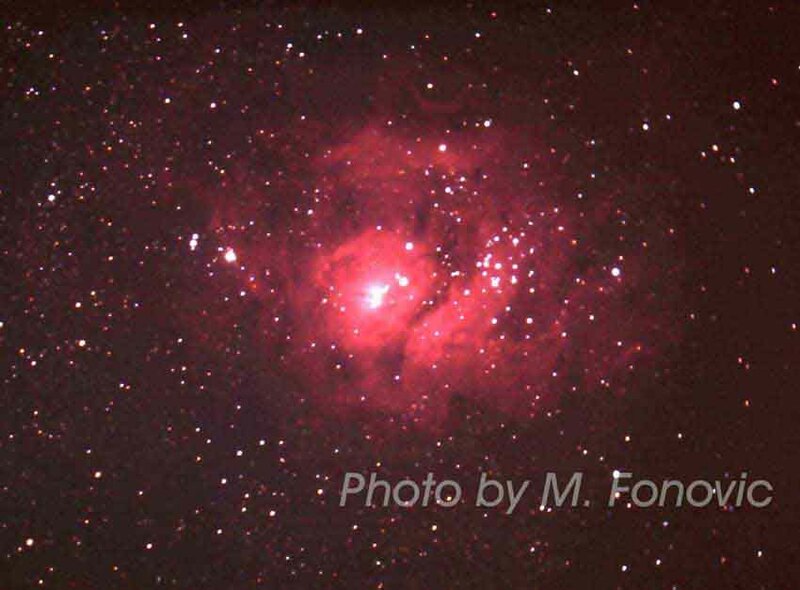 The Lagoon Nebula has an apparent extension of 90x40 minutes of arc, which is 3 x 1 1/3 the apparent diameter of the full moon, and corresponds to about 140x60 light years if our distance of 5,200 light years should be correct, which is a bit uncertain; newer sources have 4850 to 6500 light years. 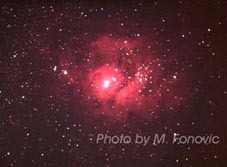 One of the remarkable features of the Lagoon Nebula is the presence of dark nebulae known as 'globules' which are collapsing protostellar clouds with diameters of about 10,000 AU (Astronomical Units) Celestron 5 at f /6.3, 40-minute exposure on Kodak PPF 400 ISO. 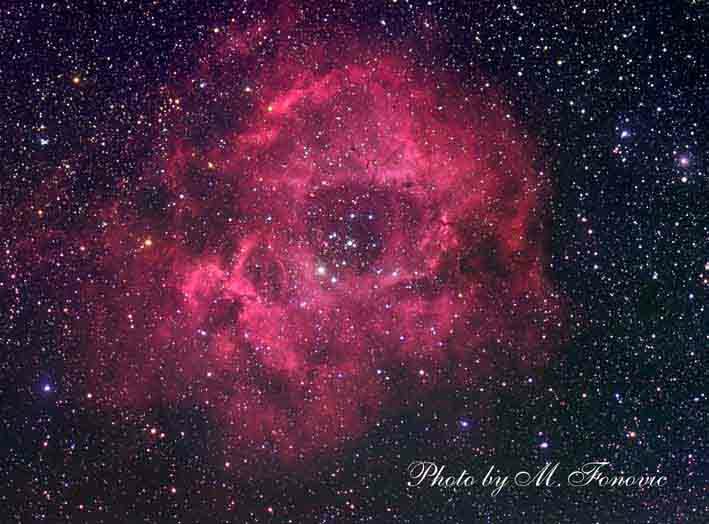 The Rosetta Nebula is a vast cloud of dust and gas, extending over an area of more than 1 degree across, or about 5 times the area covered by the full moon. Its parts have been assigned different NGC numbers: 2237, 2238, 2239, and 2246. Within the nebula, open star cluster NGC 2244 is situated, consisted of the young stars which recently formed from the nebula's material, and the brightest of which make the nebula shine by exciting its atoms to emit radiation.Two 60-min exposures taken with 6-inch f/5 refractor and Fujicolor Superia 200. 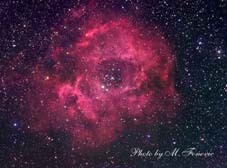 The Omega Nebula M17, also called the Swan Nebula, is a region of star formation and shines by excited emission, caused by the higher energy radiation of young stars.The color of the Omega Nebula is reddish, with some graduation to pink. This color comes from the hot hydrogene gas which is excited to shine by the hottest stars which have just formed within the nebula. 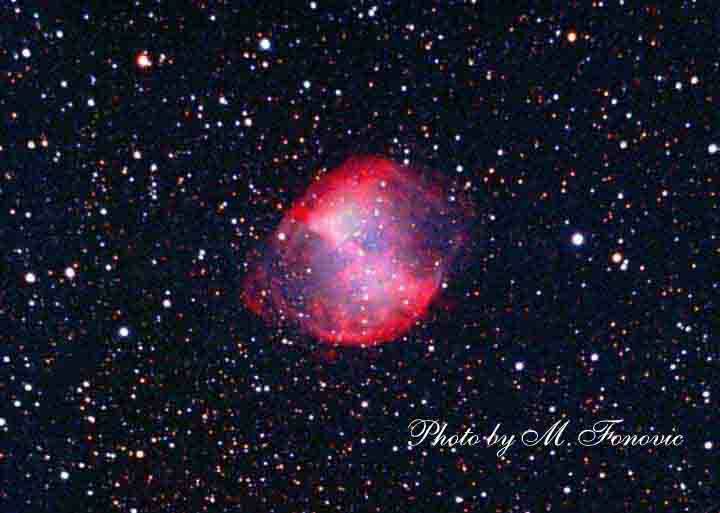 Photography taken with Celestron 8, prime focus f/6.3. 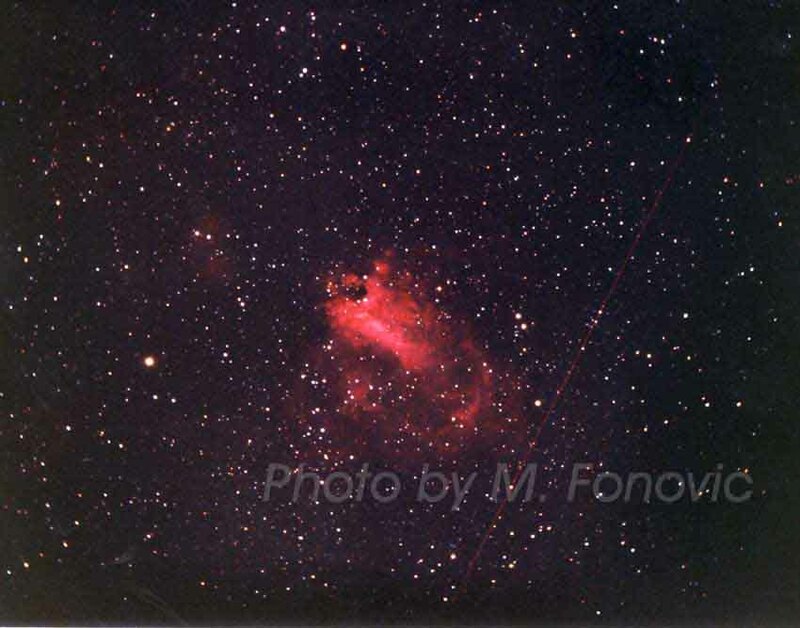 60-min exposure on Kodak Royal Gold 400.
with a small Telescope The Dumbbell Nebula M27 is certainly the most impressive object of its kind in the sky, as the angular diameter of the luminous body is nearly 6 arc minutes, with a faint halo extensing out to over 15' half the apparent diameter of the Moon. The central star of M27 is quite bright at mag 13.5, and an extremely hot blueish subdwarf dwarf at about 85,000 K (so the spectral type is given as O7. 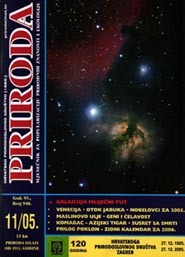 Photography taken with CCD Camera on Celestron 11 Ultima. 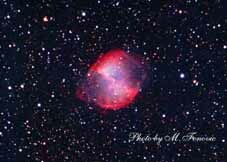 The famous Rng nebula M57 is often regarded as the prototype of a planetary nebula, and a showpiece in the northern hemisphere summer sky. 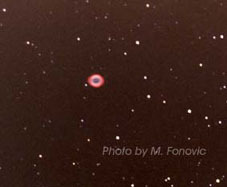 As most planetary nebulae, the Ring is much brighter visually at magnitude 8.8 than photographically at only 9.7 mag. Assuming a distance of 2,300 lightyears, this corresponds to an absolute magnitude of -0.3 visually, or an intrinsic brightness of about 50 to 100 times that of our Sun. 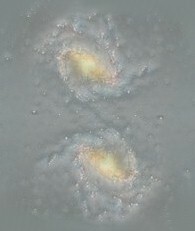 The mass of the nebular matter has been estimated at about 0.2 solar masses. Telescope Celestron 8 f/10. 60-min exposure on Fujicolor SG400. The Pleiades (M45) are among those objects which are known since the earliest times. 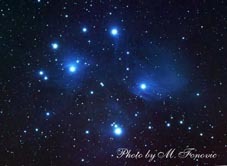 Modern observing methods have revealed that at least about 500 mostly faint stars belong to the Pleiades star cluster, spread over a 2 degree field.The Pleiades nebulae are blue-colored, which indicates that they are reflection nebulae, reflecting the light of the bright stars situated near (or within) them. 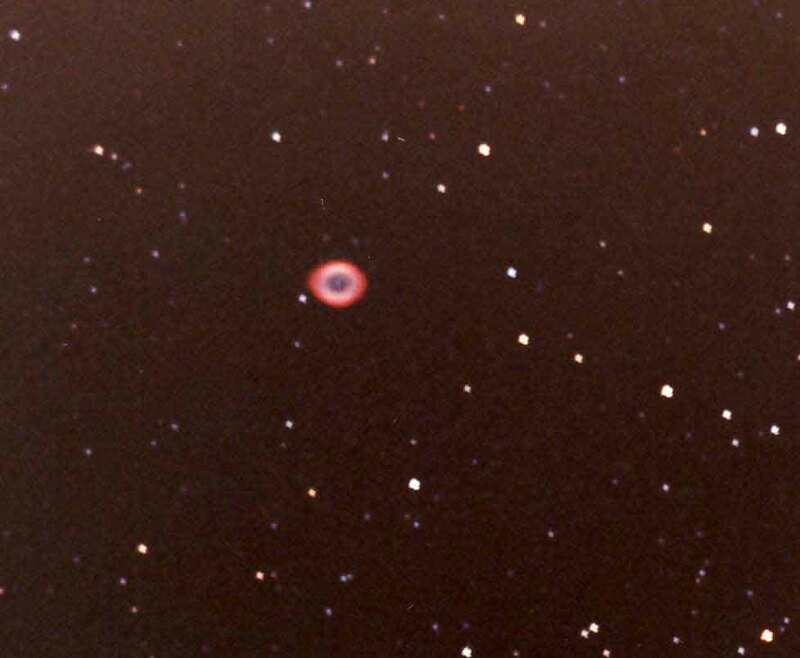 250mm Newtonian telescope at f/7, 800 ISO film, 40-min exposure. 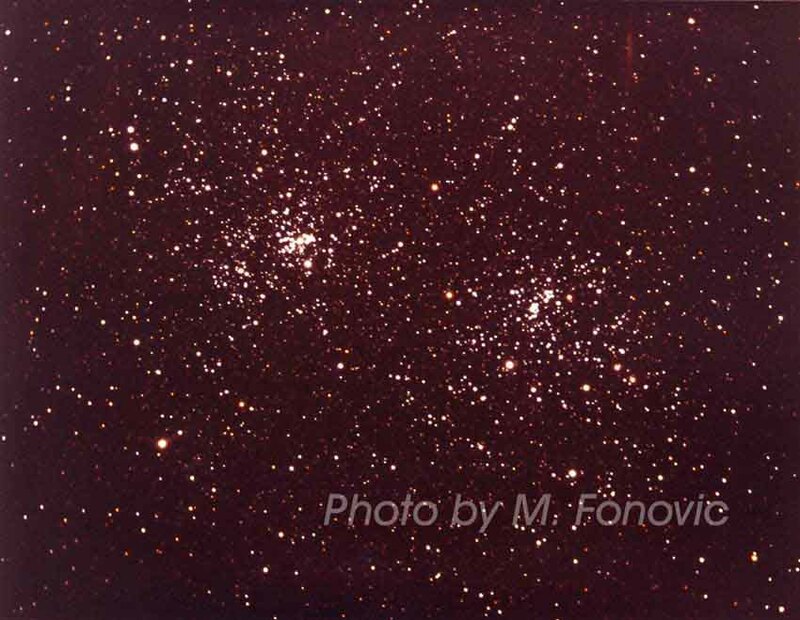 The famous double cluster NGC 869 and NGC 884 in Perseus was known in antique times.Both clusters are situated in the Perseus OB 1 association, and also only a few hundred light-years appart, at a distance of over 7000 light years. 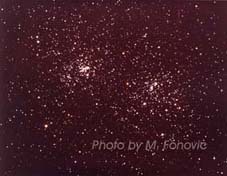 The double cluster taken with Celestron 8 at f/6.3, film Fujicolor Superia 400, 20-minute exposure. NGC 7000 North America Nebula. 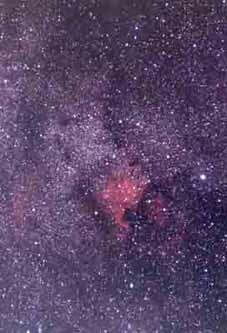 This nebula is lying 3 degrees from bright Deneb, Alpha Cygni. Some people claim it may be visible to the naked eye under good, dark conditions, and a preferred object for amateur astrophotographers. The distance to the North America Nebula is estimated at 1,600 light years. 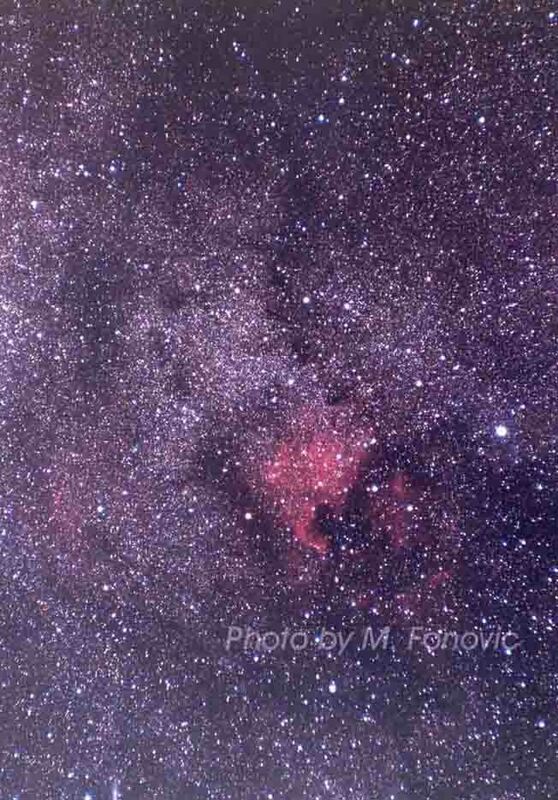 The image was taken with Celestron 8 at f/6,3, piggy back, film Fuji color SG 400, 30-minute exposure. 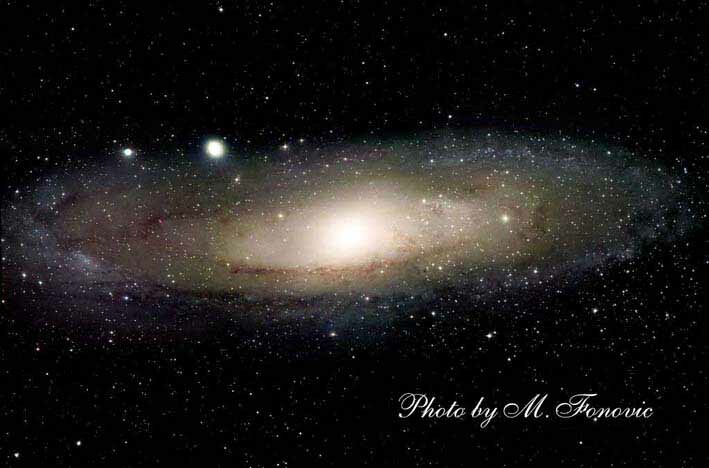 M31 is the famous Andromeda galaxy, our nearest large neighbor galaxy, forming the Local Group of galaxies.Under "normal" viewing conditions, the apparent size of the visible Andromeda Galaxy is about 3 x 1 degrees - corresponding to a disk diameter of over 250,000 light years at its distance of 2.9 million light years, so that this galaxy is more than double as large as our own Milky Way galaxy! 150-mm refractor f/6, two 40-min exposure on Kodak Royal Gold 200.
webmaster m. fonovic © 2008 - 2012 AI Press All rights reserved.